Have you ever wondered what would happen if you blended James Bond, Tintin, and Rupert the Bear together, and splashed it out into the pages of a comic book? If so, you’ve had some weirdly specific moments of imagination. 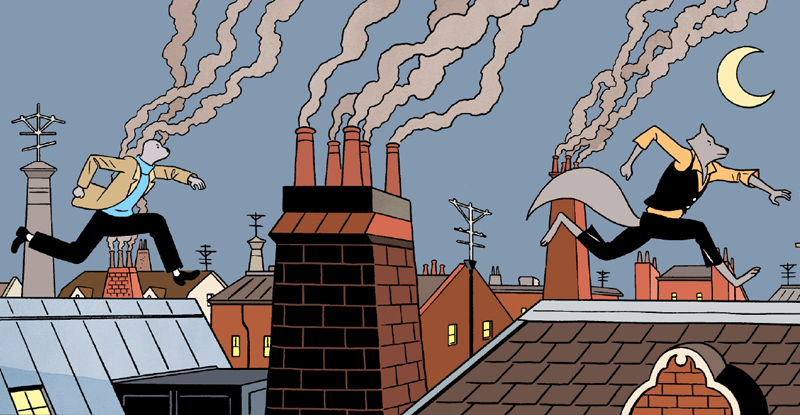 But also: you’d probably get Rich Tommaso’s wonderfully quaint new series, Spy Seal. An inherent level of absurdity lies at the core of Tommaso’s new Image Comics series—especially as the project itself has roots in a character Tommaso once drew as a child, tweeting about which lead to a wave of viral fan art and, ultimately, the Image series that began this week. But it’s far more than just the origins of Spy Seal that make it so charmingly peculiar; that absurdity is baked into every page of the book. Spy Seal is set in a Cold War-era London that just happens to be populated entirely by anthropomorphic animals—like our protagonist Malcolm, a down-on-his-luck seal in a fetching turtleneck, or his artist bird-friend, Sylvia. But Spy Seal doesn’t really acknowledge that, it’s far too busy darting from conversations about the class system and violent revolution to commentary on modern art, from wolves conducting interpretive dance to the same wolves revealing themselves as Russian secret agents and pulling guns out for an assassination attempt mid-performance. It’s from there that Spy Seal barrels toward thrusting poor Malcolm into the seedy world of spies and counterintelligence, after a chance encounter with a Russian bunny rabbit-turned-British-Agent—and another assassination—sees him promptly inducted into MI6 and given a grave mission by the end of the issue. The fact that Spy Seal deftly manages to move between all these moments of surrealist spy-fi without ever dropping a beat gives it a modern pace despite the retro stylings. Moreover, it also has the reader feeling as helpless and confused as Malcolm himself is, just happy to be along for this bizarre ride. But while there is this absurdity to practically everything about Spy Seal, its charm comes into how absolutely straight Tommaso plays the whole premise. The dialogue has a matter of fact simplicity to it, mixed with an earnestness that, alongside the wonderful art style, full of clean lines and bold colors, makes the whole thing feel like you’re reading a Hergé adaptation of a John Le Carré spy novel. Aside from the fact that everyone just happens to also be a talking animal without ever acknowledging that (I guess, really, why would they in their world), at no point does anyone, Malcolm or otherwise, actually stop, step back, and acknowledge that everything going on is completely and utterly bonkers. The absurdity and convenience of Malcolm’s journey from unemployed gadabout to surprisingly competent spy is never questioned, and neither is the convenience of the whole thing—how Malcolm just happens to bump into a sultry bunny at the art gallery he and Sylvia visit, how she just happens to invite him upstairs to the dance performance that just happens to be an assassination attempt, and that she also just happens to be a turncoat Russian operative who pledges her deadly mission to him, a complete stranger she just met, moments before her death. And honestly, Spy Seal would be a lot less interesting if it did constantly nudge at you from beyond the fourth wall, tapping on your shoulder and going “This is weird, right? You know that, right?” before carrying on. A series more unsure of itself than this would buckle under itself with an acknowledgement of its surreality, just to let the reader know that really, it too is in on the joke. The boldness in Spy Seal’s earnest commitment to its world and its sense of style, aped from the classic adventure comics we read as children, speaks to its strength, no matter how loopy its premise is. Spy Seal just goes with it, with all the grace and simplicity of its own title. And because if it, it’s one of the most charming and delightful new comics I’ve read in a while.